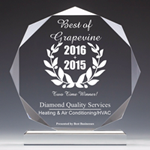 Diamond Quality Services is proud to serve the Lewisville community! About Lewisville, TX - Happy to be your hometown Heating & Air Conditioning Contractor! The city of Lewisville is located in Denton County, Texas, approximately twenty miles north of the Dallas/Fort Worth Metroplex. With more than 95,000 residents and recent population growth recorded at nearly thirty percent, Lewisville is one of the nation’s fastest growing cities and a major regional employer that is home to administrative headquarters, warehousing facilities, and distribution centers for a number of major U. S. corporations. Situated on the southern shores of Lewisville Lake, the city features a host of recreational amenities that include fishing, boating, birding, hiking, biking, and all manner of water sports. Popular local events hosted by the city include the Keeping Tradition Alive Old Town Jam Session, Western Day Festival, and Sounds of Lewisville Concert Series, held each May, September, and June, respectively. Lewisville’s convenient access to the considerable amenities of Dallas and Fort Worth is afforded by State Highway 121 and I-35 E, as well as transportation services provided by Dallas Area Rapid Transit and DCTA A-Train.